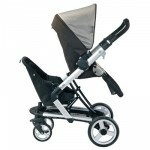 In 2008 when Peg Perego introduced the Skate stroller it was my #1 pick for strollers being introduced that year. In fact, the original Skate has been my stroller of choice to use when out at the park or mall since that time. 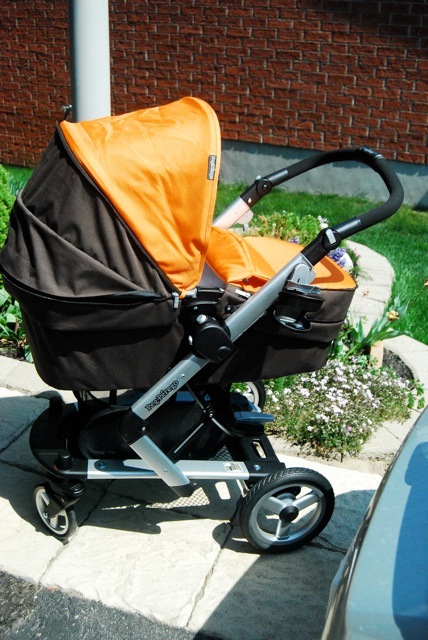 I love the way it drives on all surfaces and it’s ability to be used as a infant seat carrier, bassinet and regular stroller have made it a very valuable piece of baby gear for my family. For 2010 Peg Perego has made some fairly significant changes to the stroller, making it lighter, more practical and easier to use. We recently had the opportunity to test drive the new Skate. Installation: Out of the box all I needed to do was pop the wheels on, open it up and attach the toddler seat and canopy. Wheel installation is fairly straight forward as the front and back wheels are completely different sizes. Peg Perego has added green lines to the front wheels to give the installer an idea where to attach them. Once on, a quick turn of the lever to lock them is all that is needed. Opening the stroller is a breeze. Simply unlock it with the lever on the right hand side and pull it up. Once open parents have the choice of 3 height settings and whether or not you would like your child to face out or face you. The bassinet setting is now indicated with a symbol to help parents immediately identify the right position. When using the toddler seat there are 3 positions: upright, reclined and completely flat for a sleeping baby – all adjustable before you install the seat or with a lever at the back of the seat if needed. 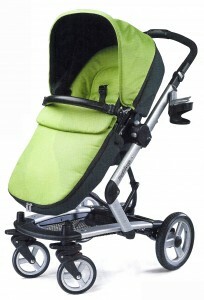 Included with the stroller is a Primo Viaggio SIP 30-30 car seat adapter. A single line and double line indicate the proper sides and positions to place each adapter. The infant car seat can only be positioned facing you, so that you can watch them at all times. One of the big changes Peg Perego made for 2010 was making the bassinet and toddler seat 2 separate pieces. Now parents don’t have to worry about memorizing the steps to convert the unit from one state to another. 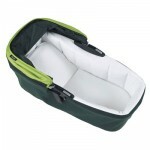 The newly designed bassinet is both spacious and nicely padded. I personally like this bassinet over the converted version. It is much more solid, secure and spacious. For your baby’s comfort it also comes with a pad that can be removed for washing. A stand is also available(extra charge) for it so that you can extend it’s use into the house or while out at a friends or grandparents house. 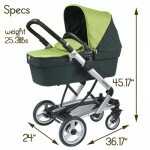 For your convenience the canopy can be used with both the stroller seat and bassinet. Like with the original model, the Skate’s canopy is extremely spacious. When opened fully, it covers most of my son, a feature that I have used in rainy weather and on sunny days. 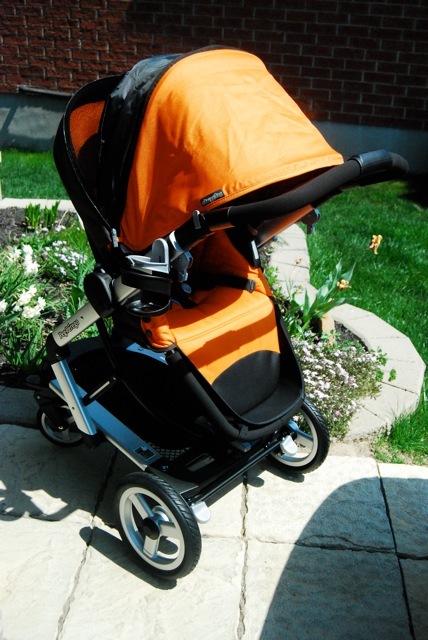 For 2010, the canopy also has a mesh screen at the back to allow air to flow through the stroller. Another big change is the addition of a fixed 5-point harness. I love this. I can’t tell you how many times my son was able to wiggle his way out of the old ‘freedom of movement’ harness used on all of Peg Perego’s previous models. The new stroller seat has also been given a new ‘tailored look’ to create some extra room for your little one. Pushing the Skate is a dream. The wheels, which are designed with ball bearings and shock-absorbing springs, no longer need an air pump to inflate them and even with my oldest in the stroller, I can push the Skate one handed through the mall while carrying my youngest. This has always been my favourite feature of this stroller. Even thought the original version weighed 33lbs + the weight of the child, it always pushed like it was 5lbs. This is also the case with the 2010 Skate as well. 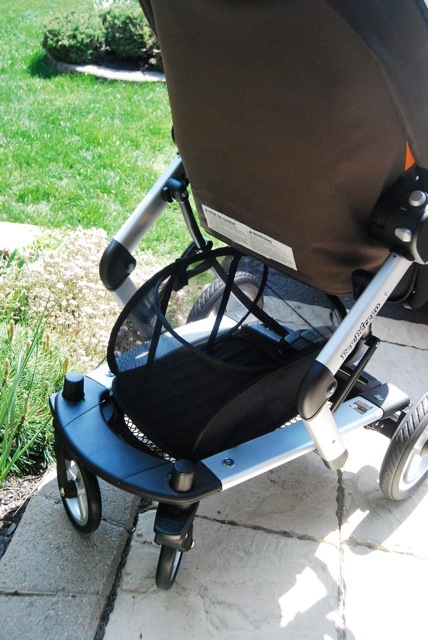 While storage under the stroller looks as though it doesn’t hold much, I have had great success with the bungee cord system Peg Perego uses. I like that the elasticized cords keep all of my purchases secure and in place while out. 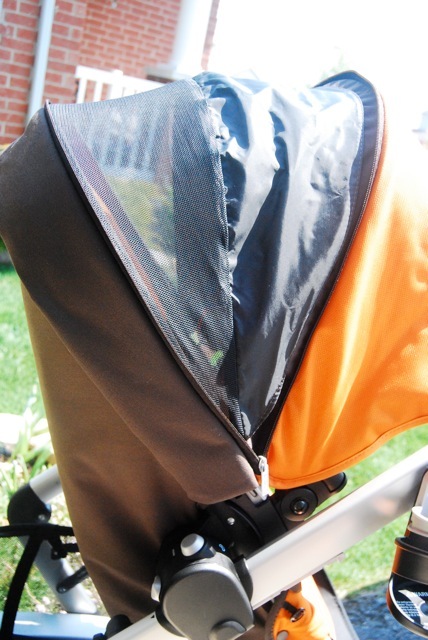 I also use the nubs on the side of the stroller meant to attach the bottle holder to carry extra bags if needed. New for 2010, the Skate comes with a shopping basket that is removable. I cannot count the number of times I have been at the grocery store and there are no baskets available. This fixes this! It can’t hold a full grocery shopping, but it will definitely accommodate a good $20 or $30 worth of purchases, something that moms who like to visit the market will love. After we originally reviewed the Skate many of our readers e-mailed us telling us the foot muff was not practical. I am happy to tell you that the new design is great. 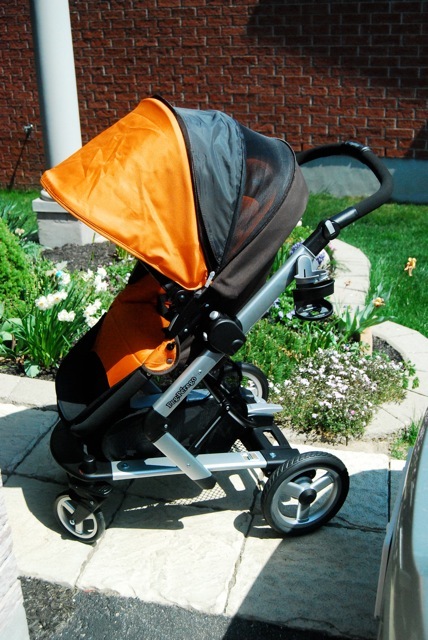 The magnets that were initially used to secure the bottom to the the base of the stroller have been replaced with a more secure set of snaps and a set of loops at the top that connect with a button. When re-designing this stroller, Peg Perego listened to customer feedback and fixed many of the issues parents were having. I would love them to come out with additional infant seat adapters so that parents who have infant car seats from other manufacturers can also use this stroller with their seats. I also wish there was a way to fold the stroller down with the bassinet or stroller seat on in any position. Currently it only folds down with the seat attached if it is in the middle position, upright, facing out. While this is fine for me, it confuses my husband when he uses the stroller. With that small issue aside, I love this stroller. All of it’s great features paired with the fact that parents can use the whole system from birth straight up to 4 years old make it a great choice for practical families. PLUS Coming very soon, Peg Perego will be introducing a jump seat that will accommodate a second child under the stroller. According to Peg Perego’s website the new seat will be compatible with all Skate models and will hold a child up to 40 lbs. I’ve been hearing so many good things about this stroller and can’t wait to test it out. My baby is coming in January and my husband and I are going to test some strollers out soon. 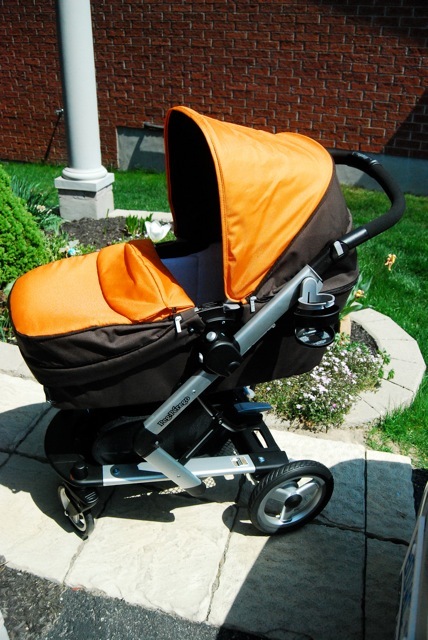 Your review made me want Peg Perego sooooo much more!! I’ve seen it and it looks great!! I can’t wait to try it out myself though! What car seat does it work with? Peg has made some great improvement to this stroller from the original. It has a really nice push, is very functional and can be used almost everywhere. (I wouldn’t travel with it). Also, new for this year look for some pretty nice new fabrics:) As for the car seat – It only works with the Peg Perego Primo Viaggio. This stroller is NOT worth the money, i bought it used for 400 bucks and sold it 1 week later because it was so bloody heavy not to mention its GIGANTIC, it will take up your entire car truck no matter what you drive, and you have to take it apart to put it up, a real pain in the azz. so glad i got rid of it, but dont get me wrong i love peg perego, i went with the pliko instead 10 million times better, and i dont have to ask my husband to help me take it to the car. I don’t like this “freedom” with 3 point harness as it was in older model also. (I saw the video on youtube). But I still think that baby should have an opportunity to move a bit while in toddler seat as far as it is safe. Well with this new 5 point harness is the baby able to move a bit? I mean a bit left-right, forward-back? I would also like to know if it is possible to use this bassinet as a portable bassinet with baby inside it? Are there any handles? I mean if baby falls asleep during walking can I take the bassinet with a baby and take it home while baby is still sleeping? Hello. The seat has a 5 point harness to limit movement. The bassinet is equipped with a handle. It can be used alone indoors or with an optional bassinet stand (sold separately).